Around the Polka Dot Household we don’t buy into the whole Valentine’s Day thing… I just can’t get beyond the consumerism. Besides my husband gives me flowers every couple of months for no reason at all… why wait for V-Day? That said, the kiddos do have Valentine’s celebrations at school and enjoy giving (and receiving) notes and sweet treats. Homemade dough colored red and cut into hearts, wrapped up in oil cloth or placed in recycled (decorated) tubs. Simple hearts cut from artwork or scraps of construction paper, with a message written on them and a Fruitabu fruit leather attached. Seed packets inside a homemade card. A spring bulb inside a tiny clay pot which has been handpainted by the kids or wrapped in fabric with a note attached. A heart shaped cookie cutter with a recipe attached. Recycled crayons in heart shapes (we used red, pink and purple). Fruit trees. (Okay, maybe not for the classroom, but I know my Hubby would love a Fuji apple tree). 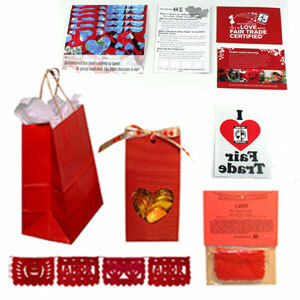 If your child gives candy with their Valentine’s keep it natural and fair trade! There are several options available at most natural food stores and online. Ya, It is a Fair Trade.